If you’re looking for a large-capacity SSD at the lowest possible price — and one that won’t regularly let you down with sub-par large-file write performance — the Limited Edition 750GB MX300 is the drive for you. That is, unless you find a great deal on an MLC drive. The drive in question? Crucial’s 750GB Limited Edition MX300, which retails for a mere $305. “Mere” in the SSD-world, at least. What’s different? This version of the MX300 actually has enough fast NAND cache to provide maximum performance during all the write operations a user will perform, not just the everyday ones. Almost all, anyway. The 15nm Micron 3D (stacked) TLC NAND used in the Limited Edition 750GB MX300 performs roughly on par with Samsung’s and Toshiba’s. 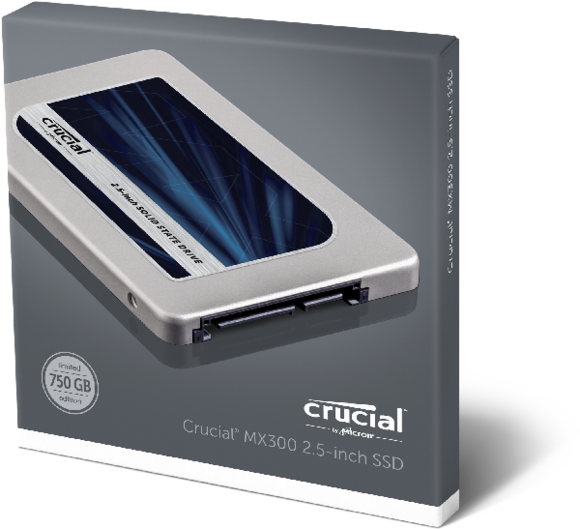 But in the case of this drive, Crucial decided to treat more of it (30GB!) as MLC: That is, writing only two bits instead of the three that TLC is capable of. Not writing that third bit both reduces the amount of data being written by a third and requires less voltage, making all the difference speed-wise: 30GB was more than enough to cover our 20GB copy tests, copying a 30GB Blu-ray rip, and a whole lot of other everyday tasks. Pretty much anything you’ll do will be covered by that 30GB, with the exception of the initial cloning operation that you’ll perform when replacing a hard drive or a similar large-scale operation. Speaking of cloning, Crucial includes a voucher for Acronis’ True Image HD software to facilitate that operation. Given the low price of the drive, that’s a pretty generous perk. The box for the 2.5-inch 750GB MX300 includes a voucher for Acronis True Image HD, so that you can clone your existing hard drive onto the MX300. Crucial sent us the 2.5-inch, 7mm version of the MX300, but an M.2 version will be available later in the year. Both will be SATA 6Gbps. The MX300’s controller is a Marvell 88SS1074, with some tweaking to the firmware by Crucial. I’m taking the vendor’s word for that—SSD vendors, including Crucial, are making it quite a bit more difficult to open up the case these days. 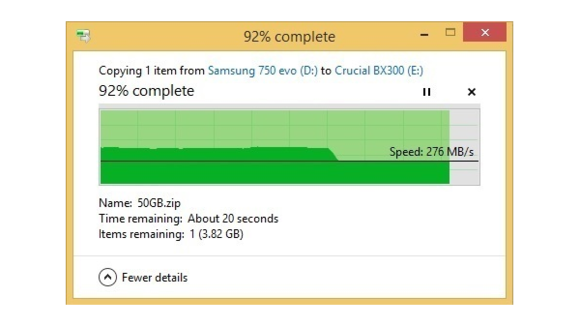 The drive comes with a five-year warranty that covers 120GB of writes per day, or about 220TBW (terabytes written). It features encryption, and is also said to write data in multiple locations for redundancy (a safeguard against failing cells or NAND chips). As the 750GB version contains 30GB of cache, no drop-off happened between the AS SSD benchmark software’s 1GB test and 10GB test. That’s not a complaint. Using slower TLC with faster cache isn’t an unusable design; it’s just that other SSDs designed this way had cache sizes that were inadequate for large write operations. As I said up front, other than the original cloning of the drive, 30GB should generally cover everything you do. AS SSD doesn’t write enough data to exceed the MX300’s cache, but that highlights the benefits of treating more of the NAND as MLC. 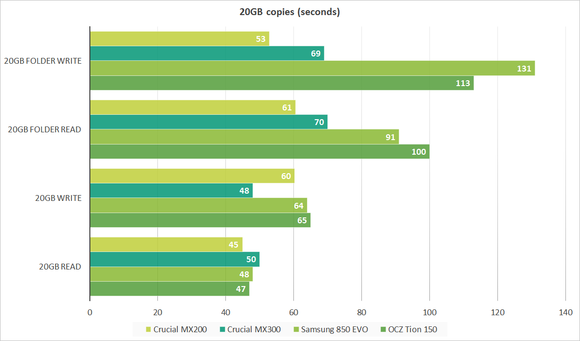 In our 20GB copy tests shown below, the MX300 performed like MLC NAND-based drives, which sport faster flash memory that doesn’t need caching and doesn’t exhibit performance drop-offs—albeit a slightly slower one. Even our formerly illustrative 20GB copy tests didn’t reveal the M300’s TLC nature. The MX300’s write performance will drop off to a little less than 300MBps, but you’ll have to transfer much more data than with other TLC NAND-based drives to hit that point. This was a 50GB copy. As seen above, it took a 50GB copy to finally show what happens when a write operation falls outside the 750GB Limited Edition MX300’s 30MB cache. The speed drops to about 275MBps, or roughly 10MBps slower than with the Samsung EVO 850, but it’s still on par with OCZ’s Trion 150 and Toshiba’s Q300 (non-Pro version). If you’re looking for a large-capacity SSD at the lowest possible price—and one that won’t regularly let you down with sub-par large-file write performance—the Limited Edition 750GB MX300 is the drive for you. That is, unless you find a great deal on an MLC drive. That caveat bears repeating. Note: This review applies only to the Limited Edition 750GB MX300. Other versions and/or capacities of the MX300 may not be so amply endowed with cache.